MONASTIC VOWS – Abbot Peter Novecosky, OSB congratulates Br. 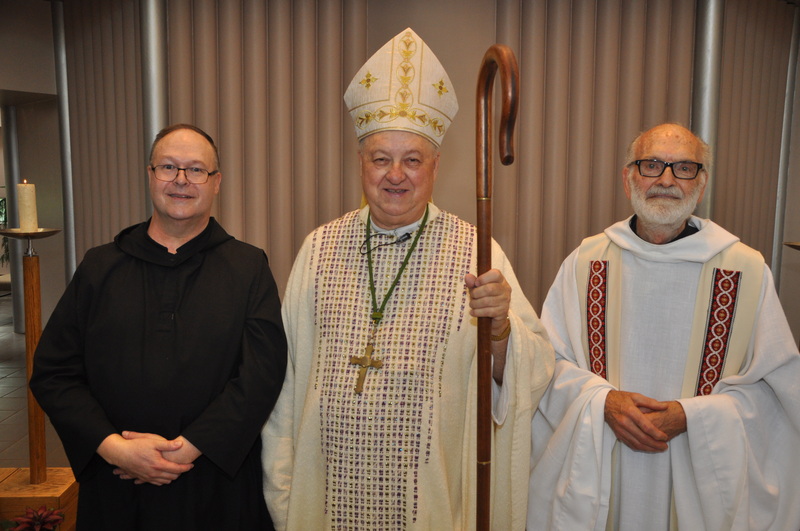 Benedict van Ginkel, OSB, left, on his solemn vows, July 11 at St. Peter’s Abbey, and Fr. Lawrence DeMong, OSB on his 60th year of profession as a Benedictine monk of St. Peter’s Abbey. “Since Br. Benedict is a musician, I think he wanted to provide a prelude to today’s celebration. And we had that prelude last night, orchestrated by God. What a sound and light show we had,” Abbot Peter Novecosky, OSB said, in his address, July 11, to the solemn vows of Br. Benedict van Ginkel, OSB. A thunderstorm, the previous night, lit up the sky and brought welcome rain after weeks of hot, dry weather. The day was special for Fr. Lawrence DeMong, OSB who was solemnly professed, 60 years earlier, and renewed his profession of vows. “It struck me that when we look back in history St. Benedict would have been about the same age as Br. Benedict is now when he wrote his Rule at Monte Cassino. We know from the document itself that two major sources guided his Rule. The first was the Bible and the second was his own experience of living as a hermit and then living in community,” Abbot Peter said in Sts. Peter and Paul Church. St. Benedict followed the same advice of St. John XXIII, when St. John served as pope and had the motto: see everything, overlook a great deal and correct a little. St. Benedict would agree that this wisdom summarizes his Rule, Abbot Peter remarked. Pope Gregory the Great wrote that St. Benedict saw much around him. He went to Rome as a young man to study and became disgusted by the violence and immorality. He sought refuge in a cave in Subiaco and then went to Monte Cassino where he wrote his famous Rule, a guide that changed the course of history in Europe. St. Benedict overlooked many things that happened around him, Abbot Peter commented. He lived among many personalities in his community and he adjusted for them. He said the abbot should arrange everything to allow the strong to have something to yearn for and the weak to be free from having to leave. Commenting on the readings, Abbot Peter said St. Paul illustrated the wisdom of the Rule when he spoke of letting love be genuine. Love, above all, overlooks what’s on the surface and sees the deeper reality of each person. St. Paul spoke of rejoicing in hope, being patient in suffering, persevering in prayer and extending hospitality to strangers. The central vow of St. Benedict is “conversion of life.” People may begin a vocation with a lot of enthusiasm and then find life tedious and boring. Conversion is difficult because it begins with a new vision and new possibilities. Br. Benedict, 54, was born in Winnipeg and named Peter by his parents August and Josephine. He has one brother and three sisters. In 1983, he began teaching piano lessons after earning his Grade 10 in piano. In 1987, Br. Benedict earned a Bachelor of Arts Degree in English and Psychology at the University of Manitoba. In 1993, he earned his Bachelor of Music in Music Education at the University of Saskatchewan. He received his Associate of the Royal Conservatory of Toronto as a piano teacher. Br. Benedict taught English to junior and high school students in Winnipeg for three years and classroom music for 19 years. In 2012, he received a diploma for teaching French immersion. He taught French for eight years, while also teaching music. “Mom has always encouraged me to keep praying and search for peace in life. I have many role models, including saints, who have inspired me in my teaching,” Br. Benedict said. Among them are Sts. Benedict and Scholastica. In 2014, he was professed as a monk at St. Peter’s Abbey where he chose the name Benedict. He serves as the abbey organist, accounts payable clerk in the business office and assistant in the library. He is studying to be a library technician.